Where do you stand on the Blackfriars End? Talking Bull > Classic Archive > Where do you stand on the Blackfriars End? Herefordshire Council have finally agreed a new lease with Hereford Football Club which secures the club’s tenancy on the ground until 2030. In a club statement issued yesterday Club Chairman, Ken Kinnersley, said “The lease extension now means we have security until the summer of 2030, which will justify continued investment in the stadium by the club, and hopefully, set at ease any concerns about security of tenure being felt by any of our supporters”. The club announcement outlined the potential for future development of the Blackfriars Street enclosure and “return the ground to a four-sided stadium”. Simon Wright considers the issue and comes to perhaps a surprising conclusion. 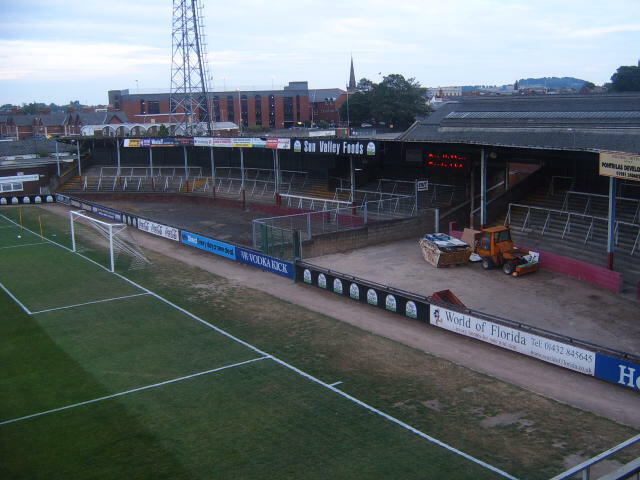 For rather too many years, Edgar Street has reluctantly been a three-sided stadium. That one end has been missing from action for so long, its empty terraces has become seen but not seen, the impact softened just by common non-use. The closure impacts more upon our visitors or occasional Hereford supporters, who are unused to such starkness. Atheistically, this is a concern. During a period when the hard work of volunteers, cash and bigger gates has given the Old Girl a new glow, our missing-End-which-is-always-in-sight strikes a jarring note. I’ve heard fellow supporters talk of “an eyesore” or even “an embarrassment”, terms which are too strong for me yet I do understand their viewpoint. The Blackfriars issue is a complex one. Hopes of gaining a “free” stand as part of a wider development are in retreat. The retail industry is having another turbulent period, as internet sales continue to rise. Like most places, Hereford frankly already has too many shop premises. With a Premier Inn going up opposite the main stand, any hopes of a hotel strategy are also doomed. Student apartments? Well, maybe in the distant future. The University of Hereford needs to be running and creating significant accommodation supply and demand issues to persuade most developers to invest. So, if our club really wants a four-sided ground, we’ll probably have to go it alone. That will be a really big decision. Edgar Street boards have history of making wrong financial decisions, chasing dreams which invariably leads to more horrible financial problems. A key tenet of Hereford FC is to only “spend what we have.” That’s so important and yet as we grow and rise up the Leagues, the pressures to spend more to “compete”, money we may not yet have, will increase. The League grant funding of 70% for building work in Step 2 could help greatly. 70% of what is of course unknown. However, it’s absolutely clear any rebuild will be, by some margin, a bigger outgoing than anything previously sanctioned by a Hereford FC board. The 2017 accounts indicate our football club does have a significant cash pile. Funds in theory are available though that doesn’t mean a new stand or terrace is the best way to spend those precious funds. What is the return on investment? Yes, it’s a boring, unromantic question but such an important one. Aesthetics just don’t cut it against pragmatism. “Nice to have” or “it looks a mess” won’t impress any finance managers and shouldn’t really be part of our Finance Directors thinking. There’s lots of other Council-owned property in the city which also needs a makeover but that won’t happen either. Unfortunately, there is little scope to imitate bigger clubs and part-fund the project by pre-selling executive boxes. Not in little old Hereford. In truth, there is no return on investment. There is no evidence that gates will rise because the Street has all four sides in operation. No strong protest group who refuse to turn up at home games until the Blackfriars re-opens. Indeed, there will be additional costs for stewarding and food provision, more cleaning costs and additional demands upon our volunteers. That end of the stadium was always the least popular and having been closed for so long, those that stood up there will have become comfortable with their amended routines. Would a new facility actually end up 75% empty? Where is the history of Edgar Street attracting 5,000 average gates (our current capacity)? Note the key word average here. One offs certainly, the good people of the Shire love a big Cup match or their annual Championship celebration but showing up regularly in those numbers hasn’t been seen since the mid-1970’s. Apparently, this was a dinosaur era of no live televised football, no mobile phones or social media, that world has gone and with it those heightened levels of supporting your local team. Our limited catchment area and geographic isolation are telling factors, our isolation also restricting the numbers of visiting supporters willing to travel to us. There are some gains to be had by greater engagement with parts of the Herefordshire community and also by tweaking our club’s ungenerous pricing for seniors but neither will generate huge attendance increases. Junior Bulls might in the long term, but only if our county can retain more of its young people. Our attendances, although the envy of most in Non-League, are not rising with our improved status. And that’s a concern, though a separate issue. Big, bottom-line question here. Why would any football club, who are only half-filling their ground even in good times, massively invest in a bigger stadium? Our existing facilities are in good nick and reasonably well-used so capacity replacement isn’t relevant here. I can see no pragmatic business reason for a rebuild. Put simply, if there is little prospect of filling what we have, why have more? Neither is a bigger capacity a legal requirement. I can find no regulation that states National League or even Football League clubs must have four sided grounds. Both Oxford United and Mansfield who have played in both in recent times have just three sides. So, legality isn’t a valid argument. To join, the Football League requires new members to have a capacity of 4,000 with potential for 5,000. That box is already ticked. If we must really increase capacity, then look at wider gangways and extra stairs for the seating we already have but are partly not permitted to sell. That’s an easier and cheaper option. Other bigger clubs over the decades have built unwisely, at the wrong time. One of the best-known examples are the Dingles of Wolverhampton who you can generally rely on for schadenfreude amusement. Twice they invested in huge building projects at the wrong time with detrimental effect on the playing budget, leading to relegation. Timing for us too is important. The big unknown for Hereford FC is the impact of a single season of consolidation. Part of our support are so punch-drunk with success that they’ve lost all sense of footballing reality. No Non-League side has ever won four successive championships. Will they stick with us if the Bulls lose several games in a row? Should we lose a third of our support for example, such rainy-day cash provision that we have could be needed to plug holes elsewhere. I understand the emotional reasons for restoring what we had in the better United days but for me these factors are completely outgunned by financial and practical realities. I believe sadly we must leave the Blackfriars in its current state. So, there you have it. Simon is not convinced, but what do the vast majority of Bulls fans think? Hereford has undergone substantial redevelopment in the last four years, and the ‘Urban Village Project’ in Hereford 2020 is intended to enable joint investment from Hereford FC and Herefordshire Council for a new stand and facilities in Blackfriars Street. So, why not take advantage of the newly relaxed grant funding limit of 70%. Some will argue there has never been a better time to “get the job done”. Spennymoor FC in peace. Could not the old sheds be demolished and leave just an open terrace for now? Unfortunately not as its part of the terraces that are unstable. The terrace was originally built on old railway sleepers and then filled with concrete 50 years ago. Whole end needs developing. Could we not have a huge wall of painted faces like one premier club Chelsea erected once upon a time? Make the Blackfriars end a little more athestically pleasing and less of an eye sore! Could we not have a huge wall of painted faces aka Chelsea FC? Big job but there are many artists out there who follow HFC. Far better than a empty sad looking terrace. l heard a fan remark about it doubling up as a temporary car park!